Antalya is a major travel destination during the summer season, due to its nearness to the Mediterranean coast. 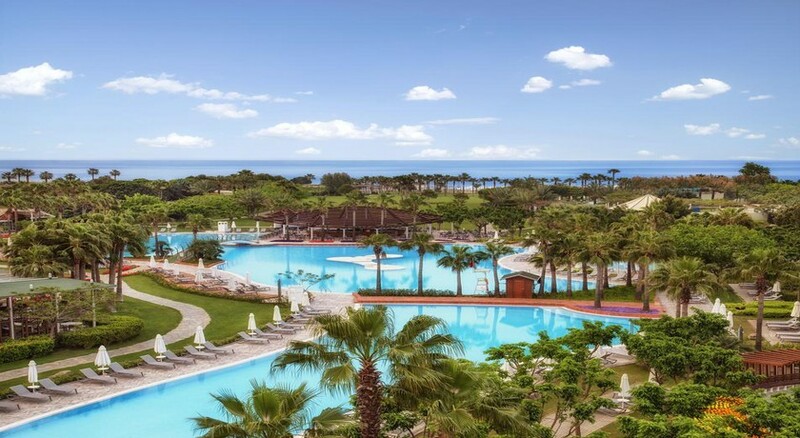 Situated near Lara Beach in Antalya, Turkey, Lara Barut Collection hotel seamlessly combines luxury with comfort to provide a unique experience for all beach lovers. Great for couples and families alike, this hotel has something in store for everyone. Its proximity to the airport and the city makes the property a preferred accommodation choice for those travelling to Antalya. The pristine white building of the hotel complex overlooks the blue pool, where guests can relax after a hectic day of sightseeing and beach-hopping. 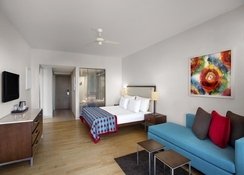 The stylish rooms and suites boast a minimalist décor and contemporary amenities. Rejuvenate your mind, body and soul at the hotel’s spa and wellness centre and indulge yourself in all the gastronomic delights that the restaurants of the hotel have to offer. This is one experience you’ll cherish for a long time. The location of the hotel is ideal. It is situated near the Lara beach in Antalya, Turkey. Even the Antalya Airport is not too far away – located at a distance of 11km from the hotel. The Lara beach, on the other hand, is just 5.4 km from the hotel premises. This golden stretch of sand on the southwest coast of Turkey is the perfect place to enjoy the warm Mediterranean sun and the cool sea breeze. The beach is lined with fabulous hotels, restaurants and nightclubs, which are always buzzing with tourists and visitors. The city centre of Antalya is roughly 23 km from the hotel. 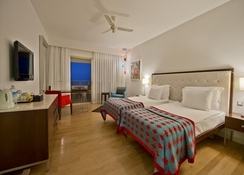 In Lara Barut Collection, you’ll be spoilt for choices, when it comes to selecting your rooms. 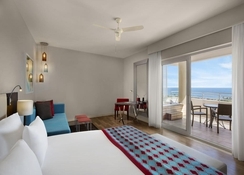 There are Standard, Superior and Deluxe rooms with sea view, garden view and pool view. Suites come in various sizes. There are Designer Suite Sea View, Designer Suite Side Sea View, Designer Suite 360° and Grand Designer Suite, along with corner suites, family suites and junior suites. Standard facilities include double beds, en-suite bathrooms with shower and bathtub, satellite television sets, hair dryers, DVD players, safety boxes, internet facilities and terraces. 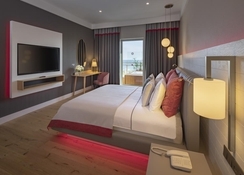 Suites have additional features such as separate living room and bedroom, balcony with Jacuzzi, private check-in and check-out, free of charge room service, daily refilled minibar, daily fruit basket service, priority at a la carte restaurant reservations and lots more. At Lara Barut Collection, guests can choose from Turkish and International cuisines at one of the many restaurants of the hotel. The main restaurant, Divan, serves buffet, while restaurants such as Çardak and Sandal serve finger foods throughout the day. Hanimeli Patisserie serves scrumptious baked goods, while Kuyu Turk Restaurant and Olive Restaurant serve traditional Turkish and Italian dishes respectively. Soya restaurant serves far-eastern cuisine and Sandal restaurant offer delicious seafood. Mediterranean cuisine can be found at Akdeniz, while Sofa a La Carte is exclusively meant for fine dining. Additionally, the hotel has lounges, nightclubs, beach and pool bars for its guests. There is a lot to do in Lara Barut Collection. Guests can lounge by the pool during daytime and take a dip in the ocean towards the afternoon. Kids can have fun at the waterpark or let off steam at the mini club or the playground at the beach area. The hotel has a youth club for teenagers that offers PlayStation, billiards, table tennis, darts, archery, DJ courses, water polo, soccer, beach volley, pool games and much more. On the other hand, adults can have a relaxing day at the spa and wellness centre of the hotel. Special messages and beauty packages are available upon request. The hotel’s pool overlooking the building is the perfect place to soak up the Mediterranean sun, read a book or have a drink or two. The hotel is spotless. The staff are very helpful and speak adequate English. The pools are big (a bit on the cold side) but very clean and with plenty of sunloungers. The beach has plenty of sunloungers too and there is a shuttle that takes you down if you don't feel like walking (takes about 10 minutes to walk). The food is very varied and there's a healthy section too. The rooms are big and well looked after. The evening entertainment was also quite good and there's plenty of activities happening during the day if you want to get involved. My partner and I went here to celebrate my birthday and New Year and what a great it was. We booked the a la carte resturant ( the only 1 that eas open at the time of year) for the night of my birthday and it was fantastic food and great service I was even presented with a birthday cake. The high light of the holiday was surly the Gala Ball on 31st, 7 course meal with the drink flowing all night. Entertainment was also provided by a live band and a belly dancer. Not sure what we can do this year to top it.... May just need to book back up again.